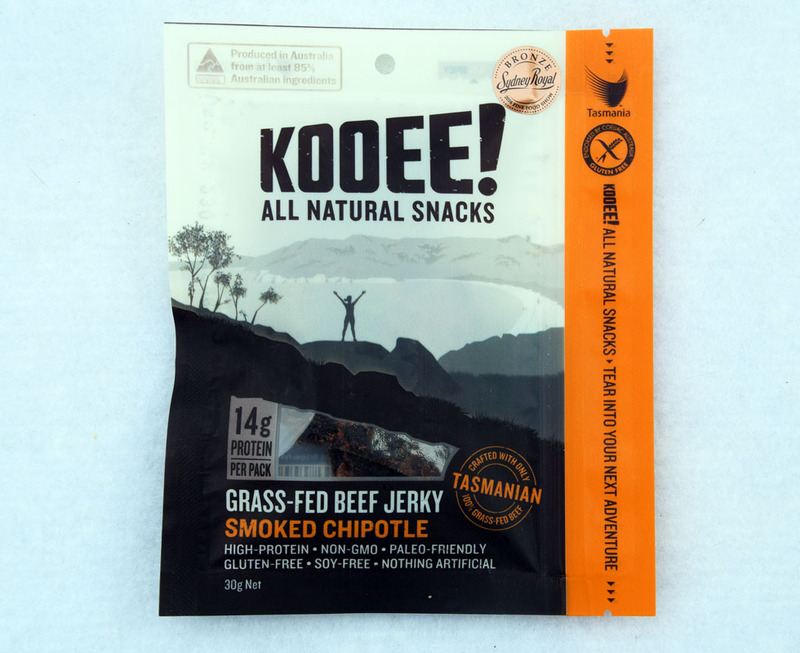 I recently had the opportunity to try the range of beef jerky from Tasmanian company, Kooee. This is a product that is sold in a variety of store ranging from outdoor stores, local supermarkets and liquor outlets. In addition it is also available online either directly from Kooee or from online stores including Wild Earth. Commercially prepared Jerky is not cheap and based on my average consumption on a typical multi-day hike this offering is no different. 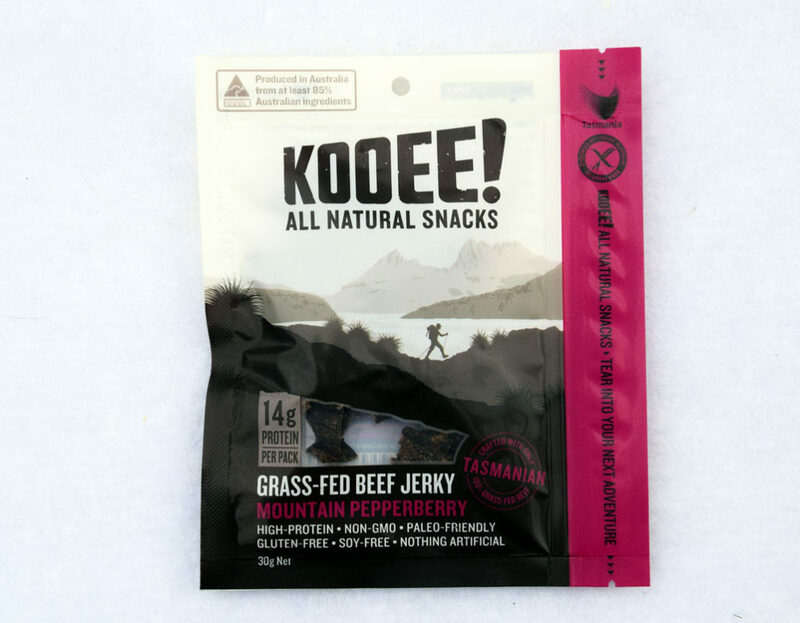 The package sizes from Kooee are 30 grams and by the time you remove the packing and the little desiccant packs your are left with around 22-29grams of actual jerky. That’s the negatives. There are however plenty of positives. 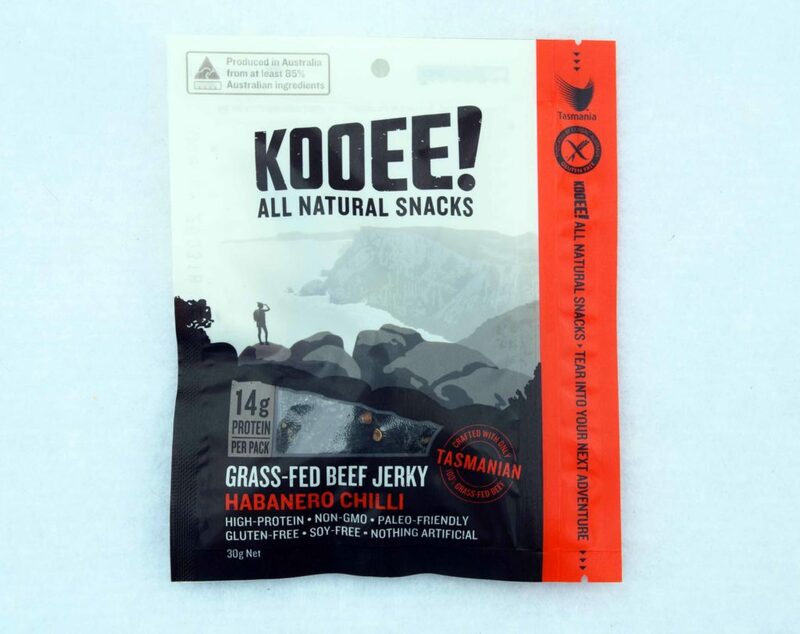 This is without a doubt the best tasting and best quality jerky that I have eaten. The meat itself isn’t greasy or oily and you don’t need to gnaw at the meat to swallow it. There is also no visible signs of fat in the meat which is often the case with some brands of jerky. 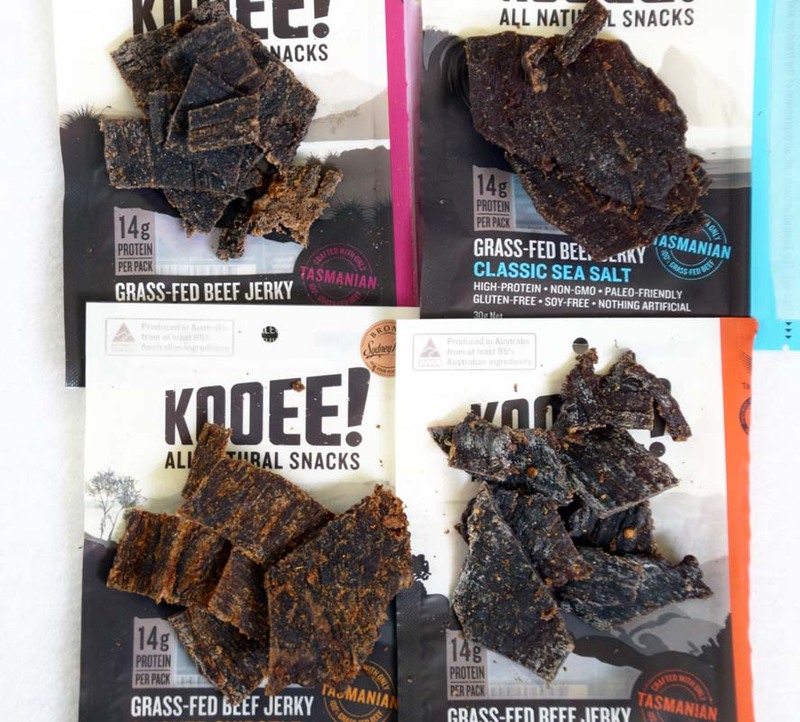 I tried the four varieties of this jerky and they very neatly fit into two categories. The mild and tasty, and the hot and spicy. You need to be very careful when choosing which jerky you buy if you don’t like spicy food. 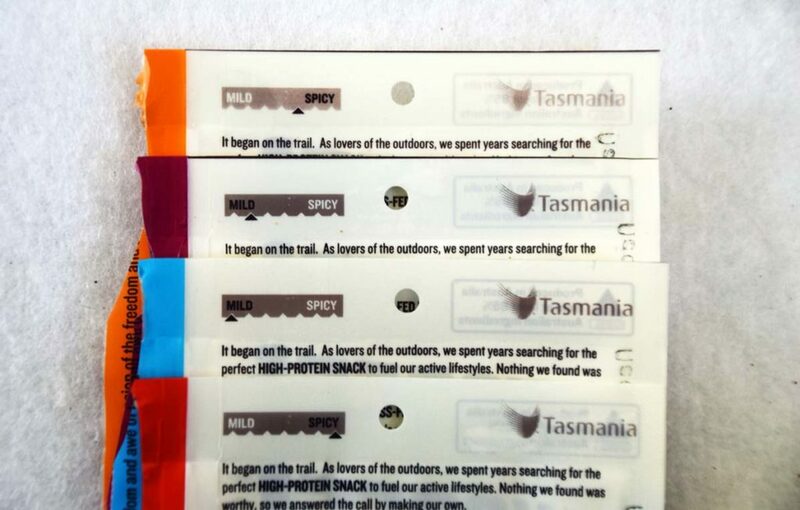 However each pack has a spiciness rating on the back which is very accurate. In addition the packaging is well thought out and once you open the bag there is a ziploc that allows you to reseal the bag util the next time you want some. This means that you don’t have to worry about repackaging for when you are preparing for a trip. For me this product was a hard one to rate. There are cheaper jerky’s around and if price is the major factor for you then this may not be the best option. If however you want an excellent tasting product and can spare the additional dollars then this product is well worth considering. If you are a spice lover you will know what Habanero chilli’s are. If you hate spicy food then you will also know purely because you want to ensure you don’t eat it by mistake. This option is definitely spicy. Its not going to burn you mouth but it definitely has heat to it. If you dont like hot and spicy the you will definilitly want to keep away from one. While not as hot when compared to the Habanero offering there is still heat in this offering and it tends to creep up on you slowly. As you would expect from a Chipotle style product this has that smokey flavouring. This one definitely has good flavour but its subtle so for those of you that don’t like the spicy options then this is a pretty good all round choice that isn’t going to offend anyone. Again another option that has good taste but without the spicyness. It has a unique native peppercorn taste (to me it almost tastes of Juniper berries) so it is better than your usual pepper flavouring. 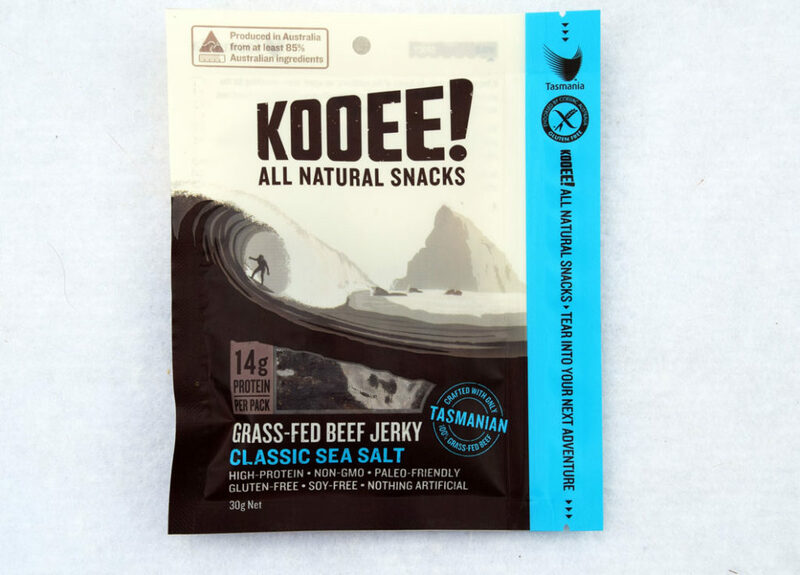 Packaging is very convenient and for me one packet equals a daily allotment of jerky. In addition the bags come with a ziploc so once you have opened it it can be resealed in the same bag you purchased it in. Very low level of fat in this beef so its not greasy to eat. The beef is also easy to eat and you dont have to gnaw at it like you do with some brands. No artificial preservatives or additives so it doesn’t taste ‘manufactured’ like some cheaper supermarket brands can do. The only real negative is the expense. Commercially prepared jerky is expensive compared to homemade versions however I don’t have the time to make jerky and provided the taste is good I will prefer to purchase.